End your search for a nice pot here with this one in your hand. Made from good quality cement, it will stay in prim condition for a long time. 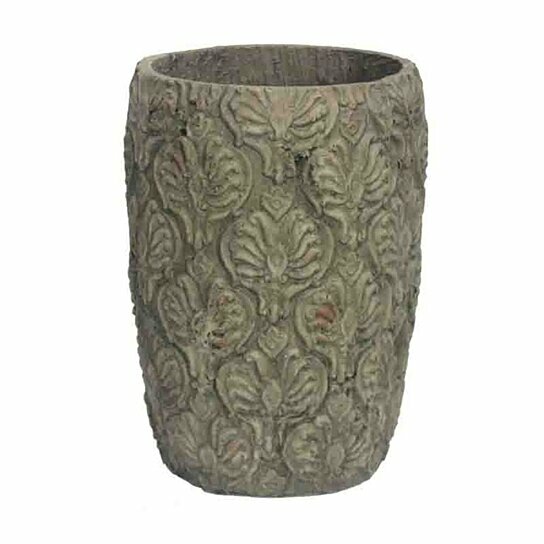 This pot is tall with a wide mouth with a narrow body, the beautiful carvings done on it makes it a unique one to own. You can keep this mud brown colored pot in your living room, bedroom, hallway or any other place of your choice. If you have a garden, you can keep this pot there as well. This is one pot, which you would never regret getting home. Wrap it well and gift it to friends who would love owning a pot like this one. High on quality and low maintenance, this will easily get along with all types of interiors. You can also recommend it to close ones. So, what are you waiting for? Go bring home this pot right now! Features a distressed texture that gives it an antique look. If you have a garden, you can keep this pot there as well.